Hello, today we are going to discuss the topic of writing a successful personal injury demand letter in Georgia to the insurance company after an accident. This is integral to being a personal injury attorney. A personal injury demand letter is a letter to the insurance company offering to settle the case or claim. That is the overall purpose of the demand letter. So, what goes into personal injury demand letters? Should You Write Your Own Demands? What Goes Into the Demand Letter? How Do You Know How Much Your Case Is Worth? In previous articles we’ve discussed the liability and who is at fault in a car accident which is necessary in order to recover for a personal injury claim, so this article is going to be more about how to draft the personal injury demand letter, but I will later post a link to a sample demand letter in one of my next articles. When drafting a letter it is important for personal injury lawyers to have the necessary documents in front of them or access to the information to draft this letter. Obviously, one of the first things were going to need is the name and address of the insurance representative, so that they may receive the letter. Along with this, goes the additional requirement of needing the actual claim number. We discussed claim numbers in the past, however the claim number is the number that the insurance company assigns to the file. With this number the insurance agent is able to locate all the information associated with the accident. It is vital and important to include your claim number or the claim number with the case in every correspondence with the insurance company during your personal injury demand letter negotiations. So, once we have the insurance agent’s name and the claim number, you also want to include the date of loss. The data of loss is just the date of the accident. Further, you’ll want to include the name of their insured. That means the name the person that the insurance company represents, and would have an obligation to pay the damages caused by them. So, that’s the most basic stuff we need to basically add in the captions and headings for the first part of the personal injury demand letter. In my demand letters, I start off with a statement of facts. This is generally non-argumentative description of what happened. This information is easily contained in the accident report or incident report. It goes over where my client was driving her vehicle, which direction, I might then include some information that is not in the accident report from my client as to where they’re going, where they had been, and that type of stuff. This all goes into the personal injury demand letter. You Need To Get That Accident Report! The accident report will also include information as to who calls the accident or the contributing factors of the accident. One of the big things look for an extra part is whether the other driver was actually charged or given a citation for their recklessness or negligence. So, in this example let’s say they were given a ticket for following too closely. In the statement of fact you’d one include that information in that there insured was given a citation by now a state the officer’s name who issued the citation. You can also look for other important information in the accident report that you’d want to include in the personal injury demand letter to fill in the blanks of this accident so that it is different from the hundreds of other accidents just like this. The next thing I would do would be to go into the damages. How Do Determine the Damages in Your Case? So, I would create damages section and I would narrate the types of injuries and the treatment that my client received. If the client went to the emergency room, I would go over the fact that the ambulance transported them to the emergency room. go over the doctors names that provided medical attention to your client. I would put in with the doctor’s diagnosis was. I would go into the following treatment the my client received and all of the medical expenses. let’s say that my client then went to physical therapy for 12 weeks. I would definitely include that and I would go deeper into listing the number of treatments and actually providing information relevant to specific treatment dates. What I mean is that if treatments 5, 6, and 7 are exactly the same in terms of the procedures provided and the diagnosis, and the clients range of motion or pain levels, then I would incorporate and consolidate that. Otherwise, I would walk the agent through each treatment, what the client received, and additional facts that show not only the level of injury the progression towards your client getting better towards the final treatments. Get all of that into the personal injury demand letter. What this does is provides a timeline and narrative of your client. You’re starting from a point where client was not injured assuming they had no pre-existing conditions, to the time when they were injured, through the treatments they underwent to get them better, to them actually getting better, or discussing future problems. If there future medical problems included in your not an attorney reading this, shame on you. If you’re an individual that has lasting medical conditions because of an accident, you must talk to an attorney. There are no if’s and’s or but’s about that. You must speak to an attorney, you would be in it it not to. Once I’ve gone through all of the cost of medical treatments. I would include this in the different section altogether. The purpose of this section is to lay out the exact amount of out-of-pocket costs that you have undergone as a direct result of an accident with their insured. in a list that is itemized. What Do You Do If You Have Missed Work or You Have Lost Your Job Because of an Accident? With regards to missing work or not being able to perform over time, and things of that nature, you will need to provide more information than you just saying it. In this circumstance, it is best to have your employer provide that information so that it is verified by them. One of the typical letters to accomplish this task is a letter called a wage verification form. This allows your employer to the state what you making and how much time you missed. If you’re self employed, this task becomes much more difficult. And this is because of the ability to fudge the numbers even though you would not. They will still complain, but you should definitely include it. All right, so we have stated the facts, we have gone through the different medical treatments and physical injuries, we have itemized the out-of-pocket expenses, now will want to discuss how the injury affected you on a personal. This part of the personal injury demand letter goes more to the pain and suffering and loss of enjoyment of life that you suffered as a result of the accident. In the final section of the personal injury demand letter, you’ll actually want to make a dollar offer to settle the case. This number must include all of the itemized damages that you included in should also include an estimation of the more intangible number of pain and suffering. I would’ve been included time frame by which you would like a response from the insurance company. I generally use 30 days because most insurance companies have monthly meetings. Motorcycle accident demand letters will primarily be the same as the generic car accident demand letter we are reviewing above. A full release ends the case entirely. You cannot sue them again. A limited release allows to you continue against any other policies available. However, those references are extremely important and not utilizing the services of a motorcycle accident attorney after a bike wreck is unforgivable. Another issue a motorcycle accidents is the use of time demand. We have written other articles on this website about holds letters and a requirement for insurance companies to pay beyond their insured’s limit if they failed to pay certain demands within certain time limits. Atlanta motorcycle attorneys for more information on motorcycle accidents. Truck accident personal injury demand letters motorcycle accident demand letters are very similar. Both involve the likelihood of the extremely serious injuries. Both involve the potential involvement of time demand letters to insurance companies. Both of them involve potential issues with the different types of releases in the one that is most beneficial for your case. However, trucking cases differ because trucking companies have much larger insurance policies than your typical individual. So, where in a motorcycle accident many times you are left without enough insurance to cover all of the damages, and a truck accident case the chance of there not being enough insurance to cover the losses is highly reduced. Atlanta, Marietta, Roswell, Decatur, Stockbridge, McDonough, Griffin, Jackson, and Macon. Don’t write your own personal injury demand letter when you can have a qualified Atlanta attorney handle the case for you. I hope you’ve enjoyed this article on Personal Injury Demand Letters, and hopefully have expressed the need to contact an attorney to help you through this situation. This post is about staying on track in personal injury settlements in car accident case. What you are staying off of is the track towards litigation, and you do not want to litigate personal injury cases with the insurance company’s outside legal counsel. The reason is because it will take much longer than you want to finish or wrap up your settlement. So, how long does it take to sue the insurance company and get paid? I would tend to say around over a year. Some cases can move quickly if both sides want that to happen, but time is money. As a Georgia personal injury lawyer and Georgia accident lawyer, I read a lot of legal books about car accident and motorcycle accident negotiations. I was reading a book on insurance negotiations the other day by James Publishing about settling auto accident cases. The article discussed tips to stay on track to settlements for car accident lawyers. First, I agree that litigation is failure of attorneys to properly value their cases and properly negotiate their personal injury settlement. Sometimes personalities get in the way. Sometimes clients get in the way, but it is their case and their life. Therefore, this is one situation that is fine, although I will speak more on client expectations later. Back to insurance settlement negotiations. The insurance adjustor’s job is to settle cases. That is exactly what they are there for. They are not the litigators who may one day try the case, they are the ones who can settle it. They have a lot of cases, and staying on one forever makes for bad business. On the other hand, they can’t settle them all or the boss will wonder what is going on. Hence the conflict and the opportunity. So, how to keep the personal injury settlement negotiations on track? Keep them on the same page. Keep them updated with all new medical bills and reports. That way, they can put all the information into their system to move them along. Remember, they must get authorization to settle each case for a certain dollar amount based on the information they receive and put into their computer system. Help them. If your medical bills start to climb higher, the adjuster can go and get additional reserves to help settle the car accident case at the right time. Some injury cases will either automatically settle or will automatically have to be tried in front of a jury and judge. I am referring to wrongful death cases. The reason why, and as an Atlanta wrongful death lawyer I know, is the value of the case is so extremely high. So, there is insurance to cover it or not. So, the individuals who would be the defendants if we brought suit might be rich. In that case, we would not settle with the insurance company and get a judgment. That way the insurance company will pay their insurance policy limits and the individuals would have a judgment that we could collect against them personally after the trial. If they are broke, then the case will be quick because the insurance company will cut the check. If they are rich, look for a long wrongful death trial. You see a similar event when you are dealing with trucking or 18 wheeler accidents. Again, sometimes the key is how much insurance is available for the injuries from the wreck. In a car accident case, you might be working with the legal minimum insurance requirements of twenty-five thousand per person and that is it. On the other hand, if were injured by a commercial vehicle or van or truck, then call a Georgia tractor trailer injury lawyer because the insurance company will play hardball. For many of the same underlying reasons that we looked at in Georgia wrongful death cases. Allow time to pass for the best offer. What the insurance companies offer on their first call will not be the same quality of offer that you will get after time. On the flip side, the insurance company may want to settle the personal case right away. What to do if the other driver does not have enough insurance or no insurance at all? 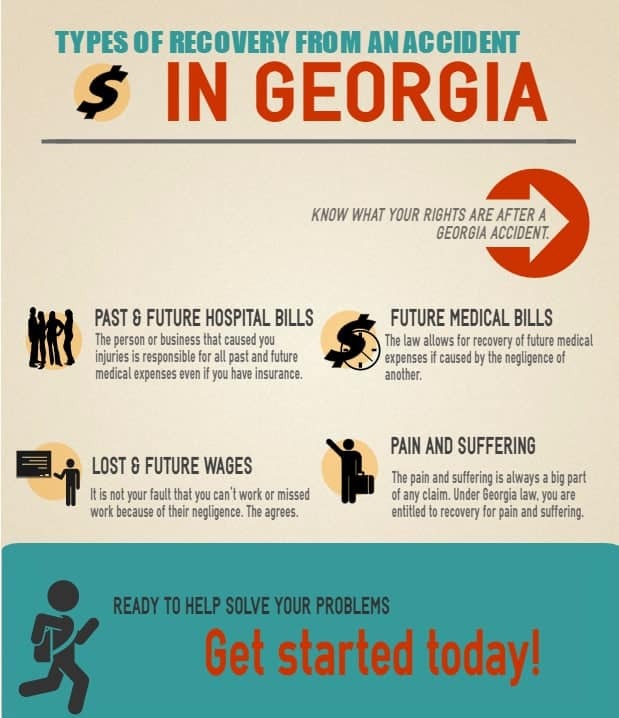 Check out this article on uninsured motorist claims in Georgia. What if the other driver took off and did not give their insurance? Check our this article on hit and run drivers in Georgia. 2019 How to Handle a Hit and Run Accident & Make Money!